Message SU...THATS IT ...The only thing wrong i stamped it on the card upside down....Ouch!!!!! Love that dry embossing Sylvie on yet another fabulous card. Two great entries, I especially love the wedding one. Lovely card. The dry embossing is fabulous, as is your heat embossing. If you hadn`t mentioned it, no one would know the card was upside down lol. 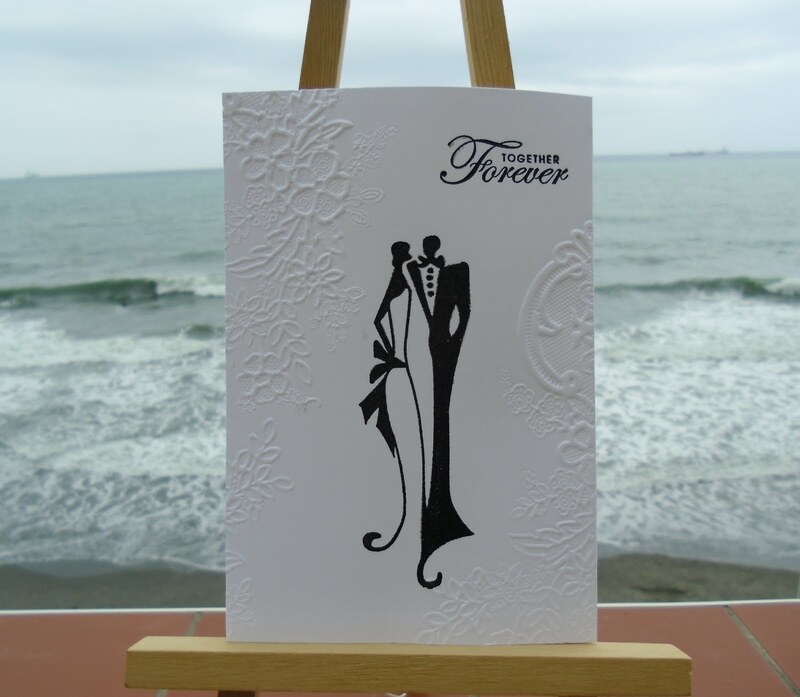 A very elegant card, I like the stylish figures and the embossing. PS Can you tell I've been catching up on my commenting - LOL!!!! Many congratulations and so deserved remember falling in love with your work last week. Gorgeous card, love that image. Easy mistake to make and one that I've done too. Firstly a WOW congratulations for being showcased, loved your card. This is another fab card, upside down? can't see that :) love it. Love the embossing on this card, and very stylish image. Gorgeous. This is equally has beautiful as the PB one. 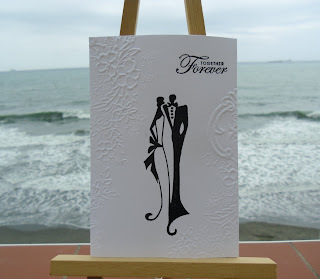 Super elegant card! I do like that image. As for being upside down - that's easy to rescue - cut and layer!!! Hi Sylvie, this card is fabulous, I love that stamp. Gorgeous stamp - love this card! Your card last week was stunning - didn't realised you had been show cased. I certainly 'cased' your heart card - just loved the idea. My card is on my blog - I have given you credit for the technique - I hope you don't mind. it's great any way up! Congrats on the Showcase!! Beautiful card! Love that embossing...and that image is fabulous! What a GREAT image. Simply stunning. Very chic and sophisticated in black and white, Sylvie, and well done on being spotlighted on Less Is More, congrats to you.